It has always been the aim in the tyre industry to get the long life of a Michelin matched with the ultimate grip of a racing car tyre. 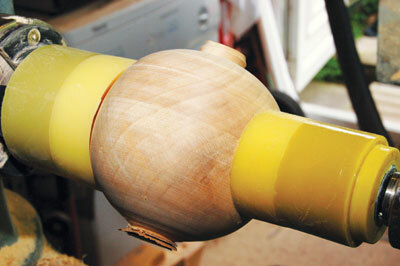 Rubber Chucky seem to have managed to reach that ultimate aim for woodturning purposes at least. Rubber Chucky products are durable urethane drives and tailstock fixings formed from a mixture of materials which you can use to drive your turnings or give support at the tailstock end by fastening them to a multi bearing tailcentre. They don't need to be forced tightly against the work because of their anti-slip properties and they don't mark or burn the turning. The products I have used most have been the Chucky vacuum seals. They are slip-on seals for the Oneway range of vacuum chucks. You don't need to scrape the old seal off when it wears out and buy or make another; these are just like comfy shoes that slip onto the chuck. The seal is equally as good as those provided by Oneway as regards grip but being far more substantial, you won't have to replace it in a hurry. These currently come in 90mm (3 1/2in), 140mm (5 1/2in) and 200mm (8in) sizes to match the chucks. These are superb. If you prefer to make your own vacuum chucks, Rubber Chucky sells them to fit 50mm (2in), 75mm (3in) and 100mm (4in) PVC Couplings as well as their own Chucky PVC Vacuum kits, too. The direct drive Rubber Chucky products either held in a chuck by clamping on the moulded tenon or, more usually, can be fitted onto a specially made, threaded MT2 adaptor. They will also fit the 'Oneway' type live centres. The Original Rubber Chucky is a urethane cone that can fit into the neck of hollow forms. The cone tapers down from 115mm (4 1/4in) to a 12mm (1/2in) point and can be used either in the headstock or attached to tailcentres with a 19mm (3/4in) x 10tpi external thread. As with the other products, they can be shaped for any specific needs. The No-Nose Chucky is basically a cone with a flat face. Again, this will fit into your standard chuck jaws via the spigot on the rear or onto the same adapted MT2 arbor - MT1 not currently available. This will drive plates, platters, the inside of bowls, etc. As with the original Rubber Chucky, this is also available in a mini version. If you make salt and pepper mills, the Pepper Mill Chucky is available to hold and drive both ends of the mill without causing any damage and if you make hollow forms, the Reverse Chucky fits inside the form to provide support for working and removing waste wood on the bottom or for finishing the vessel. The Sphere Chuckies 'do what they say on the tin'. 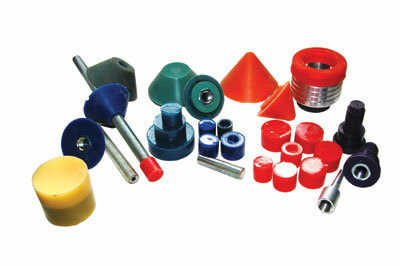 These are non-marking concave drives for holding and perfecting spheres or any turning with a radius surfaced. You no longer need the hardness of the wooden chucks to hold the ball and these will give a far better grip but by holding far less tightly. These come in three different sizes depending on what ball size you want to make. Finally sets of eight drive and tailstock 'Chuckies' are available and these cover the ranges of 25mm (1in) to 48mm (1 3/4in). The drive Chuckies fit onto the adapted arbor and the tailcentreâ€™s fit of the multi bearing chucks based on the Oneway design. The 'drive' chuckies will fit into your standard chuck jaws or on the available MT2 arbor. The tailcentres will only fit on those tailcentres that have a 19mm (3/4in) x 10tpi external thread such as the Oneway, Powermatic and some Jet lathes. These are fantastic live centres and are well worth buying as an upgrade. More products are being developed and should you have any ideas, then Rubber Chucky would love to hear from you. See details on right. I've had two months of using these products and have found them really useful. Each has a specific purpose although they can be used or adapted for other jobs. Since getting them, I haven't been able to put them away as I always have a use for one or other of them. I am very impressed.